Greenwood Village, CO – Haynes Mechanical Systems introduces its brand new Apprenticeship Training Program, Haynes University. 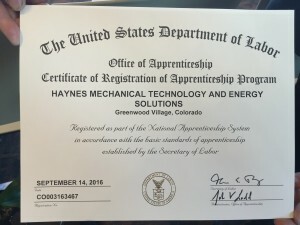 The need for qualified technicians in the HVAC industry has far surpassed the availability, and Haynes has eagerly decided to join the apprenticeship movement that Colorado Governor John Hickenlooper and U.S. Secretary of Labor Thomas Perez spoke about at CareerWise Colorado’s Youth Apprenticeship Launch event on September 26, 2016. Governor John Hickenlooper announced that Bloomberg Philanthropies and JPMorgan Chase committed $9.5 million to the new initiatives, CareerWise Colorado, and Denver Public Schools’ CareerConnect. These funds will be a game-changer for local businesses and students alike. New career path opportunities will open up for students across the state, and businesses will enjoy a new workforce that is specifically trained for their industry. Not every student graduating high school is right for a career path that leads them through college; new apprenticeship programs in industries including information technology, engineering, manufacturing, finance, professional services, hospitality, and many more will get students started on a successful career path while they are in their Junior and Senior years of high school, earning a wage and preparing them for the skills they will need to advance in a career path after they graduate, all without the debt of a tradi tional four year college. 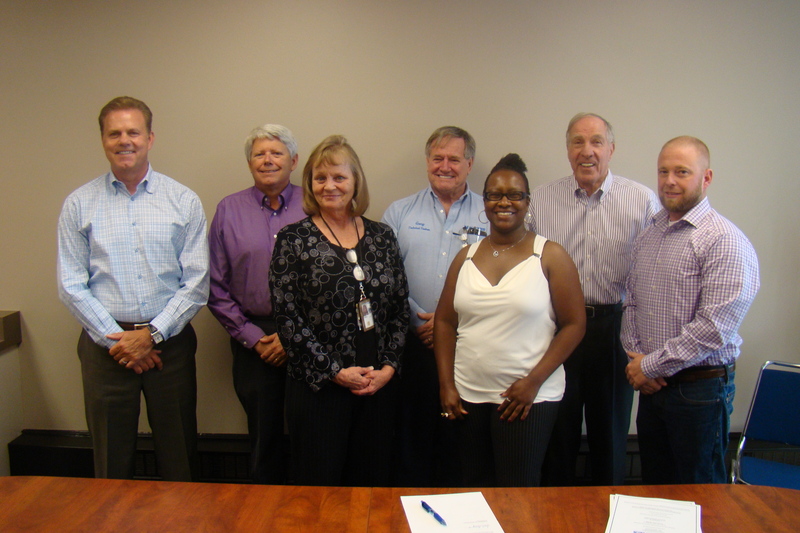 Earlier this month, Haynes Mechanical Systems signed a contract with the U.S. Department of Labor’s Colorado Office of Apprenticeship to provide the graduating apprentices’ additional accreditation and training opportunities. U.S. Secretary of Labor Thomas Perez presented Haynes Mechanical Systems with their official Registration of Apprenticeship Program Certificate today at the launch event. “This is a very exciting opportunity for both our company and our apprentices,” said Founder and CEO of Haynes Mechanical Systems, Fred Haynes. “The possibilities here are endless.” Haynes University recently graduated its first class of fourteen first year apprentices, along with seven certified technical instructors, and is now taking applications for new students. Construction broke ground in 2015 for the dedicated Haynes University facility, and students will be enjoying new classrooms and lab areas in late October of this year. The Haynes University Apprenticeship Training Program is a four year program that utilizes the earn-while-you-learn method. First year apprentices start the program earning a living wage as they gain hands-on training and on-the-job experience while attending evening classes two nights a week. An apprentice’s wage increases every 6 months based on his or her grades and attendance. Haynes University provides a Nationally Accredited curriculum through NCCER (The National Center for Construction Education and Research), and has teamed up with the U.S. Department of Labor’s Colorado Office of Apprenticeship to provide additional certifications to its four year apprentices that graduate to become Journeymen. Scholarships that cover the cost of the entire four year training program are awarded to qualified new students that successfully complete all four years of the program. For a graduating apprentice, this means they will leave the program as a licensed, experienced Journeyman Technician making a Journeyman’s wage at Haynes Mechanical Systems, with no outstanding college or vocational loans.